This has a real 'wow' factor! You take a match and light it. 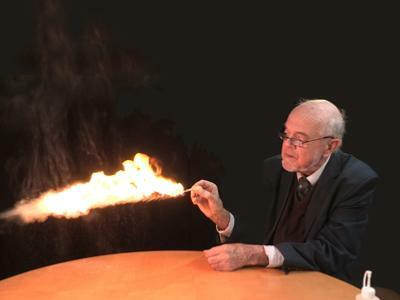 Then, when you secretly squeeze the little rubber bulb in the palm of your hand, you get a whoosh of flame. It does not get much more dramatic than that! There are no flammable liquids involved. Instead the trick uses lycopodium powder, a fine yellow powder derived from the spores of a moss. If you drop a match into a pile of the powder, it will not burn. However when the powder is dispersed in a fine mist near a flame, it ignites in a spectacular way. Once you have charged the rubber bulb with powder, you can use it to produce the effect a number of times. As well as a good supply of lycopodium powder and the rubber bulb, there is a small metal insert which fits into the end of the rubber bulb. It has two holes - one is simply to insert the match into, which means that the match is held is exactly the right position. (You may need to trim the end of your match if it is too wide - this is designed for fairly thin matches). The other hole is where the powder emerges, when you squeeze the bulb. The metal piece is coloured pink, so it tends to be invisible in your hand.Safety Warning.Normally the flame burns out too quickly to light any other combustible materials. Nevertheless care should be exercised when using this effect. The flame is very hot! Care should also be exercised if using the powder near people who suffer from asthma or hay fever or have other allergies. Perfect description! and works great.